Indeed, one can find Obama memorabilia, Obama gifts or Obama souvenirs now everywhere. With the recent monumental changes by the Barack Obama phenomenon many of you have embarked on a quest for commemorating this unique period in world history, seeking Barack Obama memorabilia, Barack Obama gifts or Barack Obama souvenirs. We at Absolute Titanium Design Studios have embarked on our own Barack Obama commemorative memorabilia of a unique kind. 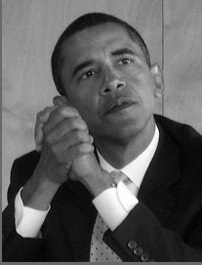 An unmatched and exclusive Obama gift, an Obama souvenir found nowhere else... Obama jewelry in Black Titanium. "Yes We Can!" --A prophetic call and promise for change, by now considered on par with Marthin Luther King's "I Have a Dream", President Roosevelt's "We have nothing to fear but fear itself" and Kennedy's "Ask not what your country can do for you. Ask what you can do for your country!". A dramatic, moving, historical moment in American History, if not world's history. 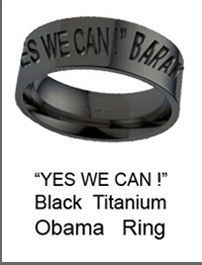 Now, commemorated in our line of Barack Obama souvenir rings and bands in our proprietary Black Titanium Rings. 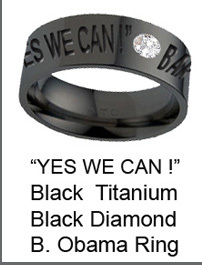 All rings are engraved on their exterior with a text wrapped around the ring that reads: "YES WE CAN!" BARACK OBAMA 2008/9 ---the years representing his election (2008) ,and his swearing-in (2009). The ring is a limited edition one (number engraved on the interior). Use it as a commemorative Obama ring item, a souvenir or a jewelry ring, or as your wedding bands! They are offered with optional glazing, additional internal inscription and a black or white 2mm diamond (those features are charged for separately). Order your Yes We Can! Barack Obama Ring or Barack Obama Diamond Ring today to be included in this limited edition! Our very own Proprietary Black Titanium Rings in which our Barack Obama memorabilia ring is carved is genuine Black Titanium. All Obama rings are considered hypo-allergenic and employ no external coating, plating, spraying, ionizing etc. Beware of rampant cheap imitations and approximations that use such external plating etc. in producing Obama souvenirs and Obama gifts purportedly in "Black Titanium". Indeed, our Obama memorabilia, Obama gifts, Obama souvenirs are quite unique in their design and material.